virtualized software defined storage system. It is meant to merge workloads so that costs are reduced and management is easier while still keeping the systems scalable and fast. Software designed storage is a loose marketing term where pools of storage resources (which are scalable) can be controlled and managed by software rather than the hardware itself. This pooling generally includes abstraction, deduplication, replication, programmability and automation. Some hardware vendors like to use Software Designed Storage and Virtualization interchangeably, but they are different in that Virtualization is the abstraction of the storage hardware from the control plane, but Software Defined Storage (SDS) adds the automation and programmability mentioned above. In a perfect world, SDS will create and manage pools of data across all of your storage devices and servers and will be hardware independent. Why do I need the Storwize V7000? The Storwize V7000 (and its smaller siblings the V5000, V3700 and V3500) are priced for Small to Medium Business use, but based off earlier Enterprise-level IBM gear. The SAN Volume Controller, Easy Tier and RAID code are from the DS8000 and the browser based web GUI is from the XIV line. They are fast, relatively affordable, highly reliable and readily available. Of course, they have the IBM name behind them and the trust that comes with that. How do I configure the V7000? Initial setup is easy. The Storwize unit comes with a USB flash drive with software on it. Plug the drive into a Windows PC and perform some initial setup; transfer the drive to the V7000 where the settings are moved over and then finish your configuration via a web browser. If the Recommended Settings option is chosen in the Storwize setup wizard, the IBM GUI does a good job of walking you through the setup and data transfer process. While it’s not Enterprise-level difficult, a familiarity with the basic concepts of this type of storage device is helpful. How much storage does it provide? Pricing on these is definitely heading down from the initial launch price and now is a great time to purchase or just check out pricing on a configuration. Just need an upgrade on the drives? We can help with that, also. Make sure to ask about selling your smaller drives to us for a healthy discount on your purchase. Have questions? Need more information or prices? Maximum Midrange is happy to help out. Phone calls or email requests are no hassle, no obligation and free. 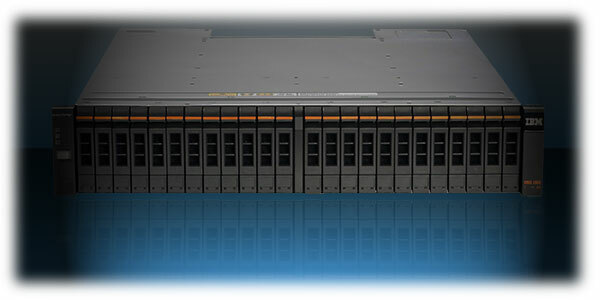 Have 30 seconds for a video on IBM Storwize v3700 and v7000 drives?